This event has now been run and won (by Gill Fowler, Jess Baker and Neil Hawthorne). If you have event photos, please send them to Joel or provide him with a link to their location. Lose any property? See if you can find it here. As the temperatures start to settle down, giving us those splendid autumnal days and cool (but not cold!) evenings and nights, so the rogaining season moves towards the longer events. We especially prepared an autumn event for you that gave you a chance to kick back in the evening at the hash house, enjoy some of Vicki Cooper's fine cooking, and then stroll 100 m to the local hotel for a wee dram before turning in, to be up at a civilized time in the morning to pick off a few controls. 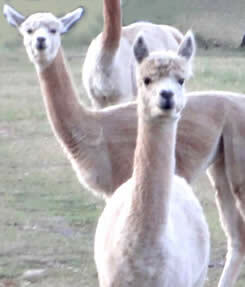 The Autumn Alpacagaine was held at Gundy, on the Pages River near Scone. The site was also used for the Australian Championships in 2000 and also for the NSW Championsips in 2004. It offers a mixture of open farmland, native forest and curiously long-necked grazing animals (and, we have to confess, the odd thistle). Joel Mackay and Graeme Cooper, the course setters, did a terrific job (hang on, who writes these web pages?) in creating a course that tested navigational skills and one's ability to go up and down hills! Like all NSWRA rogaines, anyone can enter. You have to make up a team of between 2 and 5 people. If you are under 14 years of age on the day of the event you must have an adult in your team. This event offers an "Under 23" age category in place of the "Junior - under 18" category. The other age/gender based categories plus the 'Novice" and "Family" category are the same as usual. The start and finish time for the "15-in-24 hour" event are the same as for the 24 hour: midday Saturday and midday Sunday. The difference is that in that period you have to spend at least 9 hours at the Hash House. When you do this is your choice. Note that this event offers the "Under 23" category instead of the usual "Junior".